Disdaining traditional great power politics in the Middle East, President Xi presented China as a viable new alternative: a sui generis great power in the region, employing fresh tactics to solve problems its peers have not. China’s economic reach in the Middle East is burgeoning through oil imports and machinery and textile exports, and its ambitious Belt and Road Initiative, touted as the most important feature of President Xi’s foreign policy, aims to gradually rebuild the legendary Silk Road network of trade routes that ran from China through Central Asia and the Middle East into Africa and Europe.2 The country has for decades maintained a policy of “non-interference” in the Middle East, a region in which the United States remains the major outside player, and today Beijing holds the unique position of friend to all Middle Eastern leaders and enemy to none. Recent moves may signal a shift toward greater Chinese diplomatic and security engagement in the Middle East. China’s status as a rising world power is by now clear, reflected in its economic prowess4 and growing military strength.5 Its position in Asia is well-established, and actions in the East China and South China Seas of late have rankled American policymakers and are likely to be on the agenda when President Trump meets with President Xi this week in Florida.6 With that as a backdrop, some see China’s growing role in the Middle East7 as signs of an opportunistic long game8 to fill the “vacuum” left there by the United States under the Obama administration.9 However, these actions are more accurately understood as incremental steps that represent a deepening investment in a strategic region—not necessarily a Chinese plan for an activist engagement in the Middle East. This report looks at China’s policies and commitments in the Middle East, including its regional alliances, role in regional conflicts, and trade relationships. It collates research on arms transfers to the Middle East and Chinese imports and foreign direct investment in the region. It also examines Beijing’s troubled relationship with its Muslim population at home, which is often cited as a complicating factor in diplomatic relations with the Middle East. Finally, it provides information on China’s overall military spending and international footprint, which sheds light on current and future involvement in the Middle East. It concludes with recommendations of issues to watch as China explores new engagements in the region. China’s “One Belt One Road” Project (OBOR; also known as the “Belt and Road Initiative”) is an ambitious plan to rebuild the old network of trade routes that ran westward from China through Central Asia and the Middle East into Africa and Europe, known as the Silk Road. Beijing launched OBOR in 2014 with $40 billion in investment, and it has been largely focused on developing infrastructure and gas and oil pipelines throughout Central Asia.14 As part of the project,15 in 2015 China took control of Pakistan’s strategically located Gwadar port, giving the Chinese access to the Strait of Hormuz (through which 20 percent of the world’s crude oil is transported) and the Arabian Gulf.16 OBOR is now beginning to show its reach into the Middle East as well with important connectivity points in Iran, Egypt, and Israel. The Chinese military participates in a multinational joint maritime blockade drill on February 13, 2017, in waters off Karachi, Pakistan. Source: China Military. Most China analysts agree that Beijing’s top foreign policy priority is promoting its own economic interests, and that appears to hold true for the Middle East. During Saudi Arabian King Salman’s recent visit to Beijing, President Xi said, “the solution to many issues in the Middle East lies in development.”21 (The two nations signed a memorandum of understanding worth $65 billion in investment cooperation during that visit. )22 China is the largest exporter to the Middle East and North Africa region23 (MENA; see map below) and the largest importer of MENA oil since 2010.24 Its economic interdependence is high with its closest allies in the region, and growing with others. Map Source: World Integrated Trade Solution and Observatory of Economic Complexity, MIT Media Lab. Saudi Arabia has also long relied on China for weapons sales, a business relationship that has grown over time. Riyadh began purchasing Chinese intermediate range ballistic missiles (IRBMs) in the 1980s—weapons its number one arms supplier, the United States, was unwilling to provide because of opposition from Israel. Today, China continues to supply Saudi Arabia with weapons it cannot buy from the United States, including drones that can carry cameras and missiles.33 At a ceremony this January, Saudi Arabia unveiled one of its Chinese CH-4 drones armed with at least two Chinese-made missiles,34 confirming press reports that China had indeed armed the drones it sold to Saudi Arabia (imagery of the drones on display carrying missiles was analyzed for TCF by Senior Researcher Pieter Wezeman at the Stockholm International Peace Institute (SIPRI)).35 China recently boasted that its new Wing-Loong II armed drone had secured the biggest overseas purchase order in the history of Chinese UAV sales,36 although the quantity and recipient were not disclosed (an unconfirmed report37 suggested it was Saudi Arabia with a purchase of 300 drones). That adds Saudi Arabia to the short list of countries who own armed drones,38 and thanks to China, they are also about to join the even shorter list of countries who produce them. Saudi Arabia’s King Abdulaziz City for Science and Technology just announced a partnership agreement with the China Aerospace Science and Technology Corporation to manufacture Chinese-made drones in Saudi Arabia39—the first such factory China has licensed in the Middle East and only the third outside of China (the other two are in Pakistan and Myanmar).40 The drones will reportedly be used for both military and civilian purposes and be marketed to other countries in the region.41 In the fall of 2016, Saudi Arabia and China also held their first joint counterterrorism drills in the southwestern Chinese city of Chongqing.42 Two issues have muddied their growing relationship in recent years: China’s non-interventionist approach to the war in Syria, and its friendship with Saudi regional nemesis Iran. China’s relationship with Iran grew significantly43 during the years that international sanctions were in place, and it is now Iran’s biggest trading partner.44 Beijing was widely praised for the positive role it played in the P5+1 negotiations45 that produced the Joint Comprehensive Plan of Action (JCPOA) which restricts Tehran’s nuclear program in exchange for the lifting of international economic sanctions against Iran.46 China has continued to defend the Iran nuclear deal since the inauguration of President Trump, who made repeated threats on the campaign trail to tear it up.47 Chinese President Xi Jinping was the first international leader to visit Tehran in January 2016 after the deal lifted restrictions, and the first Chinese leader to visit in fourteen years. That visit yielded seventeen accords between China and Iran48 for cooperation in areas including energy, trade, and industry, and an agreement to increase trade up to $600 billion over the next ten years.49 Iran is also seen as a central waystation in the OBOR project. China’s “Five Principles of Peaceful Coexistence,” first put forth by Prime Minister Zhou Enlai in 1953 in a meeting with the Indian government, continue to form the official basis of China’s foreign policy and help to explain their approach to conflicts in the Middle East.54 The principles are: mutual respect for sovereignty and territorial integrity, mutual non-aggression, mutual non-interference in each other’s internal affairs, equality and mutual benefit, and peaceful co-existence. Syrian President Bashar al-Assad spoke warmly of Syrian-Chinese relations in a recent television interview by Chinese broadcaster Phoenix Television.55 China has repeatedly cited its policies of mutual non-intervention, respect for sovereignty, and non-aggression in its decision to side with the Assad regime in the war. In 2014, China sold 500 anti-tank missiles to Damascus,56 and the Chinese ambassador to Syria recently commented that “Syria has witnessed a positive progress, particularly after the Aleppo battle late last year, in terms of the war on terror.”57 Beijing has seemed content playing no more than a small part in international attempts to end the conflict, including through the United Nations Security Council58 (UNSC) and the International Syria Support Group,59 despite having appointed a special envoy to the crisis60 in March 2016. On the region’s most incendiary conflict, China has managed to carve a neutral place for itself and has offered help with negotiations multiple times. China was one of the first countries to recognize Palestine, in 1988. It did not establish official diplomatic relations with Israel until 1992, mainly for fear of harming its close relationship with Arab countries.75 The relationship between China and Israel is largely based on extensive economic interdependence, but China continues to tread carefully in its public support of Israel because of its relationships throughout the Arab world.76 During a visit by Israeli Prime Minister Benjamin Netanyahu to Beijing on March 21 this year, President Xi told Netanyahu that peace with the Palestinians would be good for both sides, adding that China “appreciates Israel’s continuing to take the ‘two state proposal’ as the basis for handling the Israel-Palestine issue.”77 Beijing has advocated for a two-state solution with East Jerusalem as the capital of Palestine, a position it reiterated in the 2016 “Arab Policy Paper,” along with its support of a two-state solution in Israel/Palestine based on the pre-1967 borders. In 2013, Palestinian President Mahmoud Abbas and Netanyahu visited China in quick succession, though they did not overlap, and President Xi presented a four-point plan to bring the conflict to an end.78 In 2014, China produced a five-point plan.79 Neither have moved forward. A look at China’s overall military spending and international footprint helps to contextualize its actions in the Middle East. China’s military budget in 2016 was $145 billion, second only to the United States (which dwarfed all other countries with a budget of $600 billion).93 Despite an economic slowdown, China remains committed to developing and modernizing its defense capabilities.94 The People’s Liberation Army (PLA) has stepped up military exercises with Russia as part of an overall increase in defense cooperation between the two countries.95 China is also engaging in more joint counterterrorism drills in Central Asia. China is building its first foreign base in the tiny African nation of Djibouti, strategically located in the Horn of Africa just twenty miles across from Yemen’s coast. Beijing, which has a longstanding policy of no foreign military bases,96 calls it a “logistics facility” and says it is set to install “a few thousand” troops97 there but is pledging not to engage in military expansion.98 The Chinese government also says the base will mainly serve as a rest and relaxation post for the upwards of 2,400 Chinese troops helping with anti-piracy, U.N. peacekeeping and humanitarian rescue missions in the area.99 The Chinese People’s Liberation Army Navy (PLAN) has been conducting anti-piracy operations in the Gulf of Aden and off the Horn of Africa since December 2008, along with ships from several other nations.100 More than a fifth of Chinese-owned, -cargoed, or -crewed ships faced piracy while transiting Somali waters, and seven were attacked. 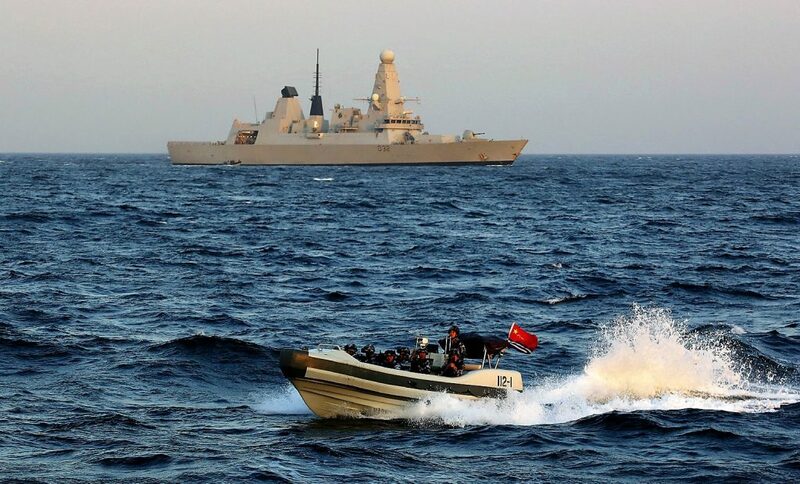 Although the piracy threat has faded since 2012, China has not reduced its involvement. 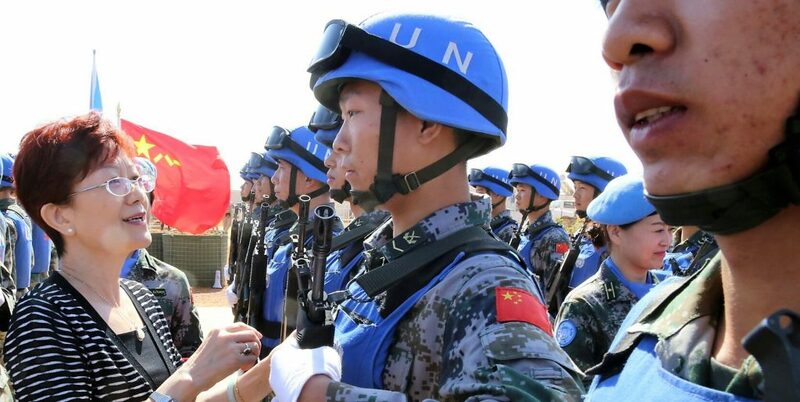 China has assigned more peacekeepers to Africa than any other permanent member of the UN Security Council, with more than 2,600 troops, police and experts participating in seven of the nine UN missions on the continent. China has assigned more peacekeepers to Africa than any other permanent member of the UN Security Council, with more than 2,600 troops, police and experts participating in seven of the nine UN missions on the continent.102 In 2015, President Xi announced a series of measures to increase China’s participation in the missions in Africa.103 This included a pledge to set up a permanent peacekeeping police squad, build a standby force of 8,000 troops, increase Chinese training of foreign peacekeepers, carry out ten minesweeping assistance programs over the next five years, and deploy its first helicopter detachment. Lu Huiying, the Chinese ambassador to Mali, presents the United Nations Peace Medal of Honor to peacekeepers from the 4th Chinese peacekeeping engineering detachment to Mali on Feb. 2, 2017. Source: China Military. China currently ranks fifteenth on a list of arms suppliers to the Middle East, but retired Lieutenant Colonel James Dickey, of defense and security intelligence firm IHS Jane’s, said that he expects them to move up in coming years. “The Chinese have been making a concerted effort to make inroads into the Middle East arms sales market,” Dickey said in a phone interview.104 According to a report by the Stockholm International Peace Research Institute (SIPRI), China’s exports of major arms nearly doubled over the past five years.105 The majority go to states in Asia and Oceania, with Pakistan the main recipient followed by Bangladesh and Myanmar (sales to the Middle East make up less than 2 percent of total sales). In the same period, China’s arms imports decreased by 25 percent, signifying that it is increasingly capable of producing its own advanced weapons. In the early 2000s, China was by far the largest importer. China’s “pivot west” may not materialize entirely as some analysts have predicted, but it is clear today that the rising power’s economic bounty is seen as a boon by many in the Middle East. It may be criticized for its mercantilist policies, but it has proven more willing to participate in economic initiatives in the region, such as in Egypt, and it has shown greater interest in doing so in the future in countries currently racked by war, like Syria.106 It also provided a market for Iran while U.S. and European sanctions were in place, and continues to be its largest trading partner. On the other end of the regional spectrum wealth-wise, China’s already robust economic interdependence with oil giant Saudi Arabia appears to be on the rise, as are its relations with other Gulf nations.107 Many more opportunities for investment are likely in the region, particularly if the ambitious plans for OBOR begin to be translated into reality. On the military front, U.S. policymakers are likely keeping an eye on China’s increasing weapons sales to the region, and their latest decision to open a drone factory in Saudi Arabia. U.S. arms sales to the region far exceed those of China, but while the United States has only sold its armed drones to the U.K. and Italy, China has supplied them (both armed and unarmed) to Saudi Arabia, Iraq, the United Arab Emirates, and Egypt.108 China is also filling the gaps for countries who cannot purchase arms from the United States—it is in the top three suppliers, behind Russia in each case, to Iran, Syria, and Algeria. China’s promise to step up military cooperation with Russia in Syria should be watched. On the other hand, the United States and China may eventually cooperate militarily on counterterrorism campaigns in the region. Even before the recent ISIS video that showcased Uyghurs vowing to retaliate against their oppressors in China, Beijing had stepped up joint counterterrorism operations in its Western provinces and in Central Asia. It recently staged its first such operations with Saudi Arabia,109 and claimed that it was doing the same in Afghanistan110 last month after reports surfaced that Chinese troops had been spotted in the country. 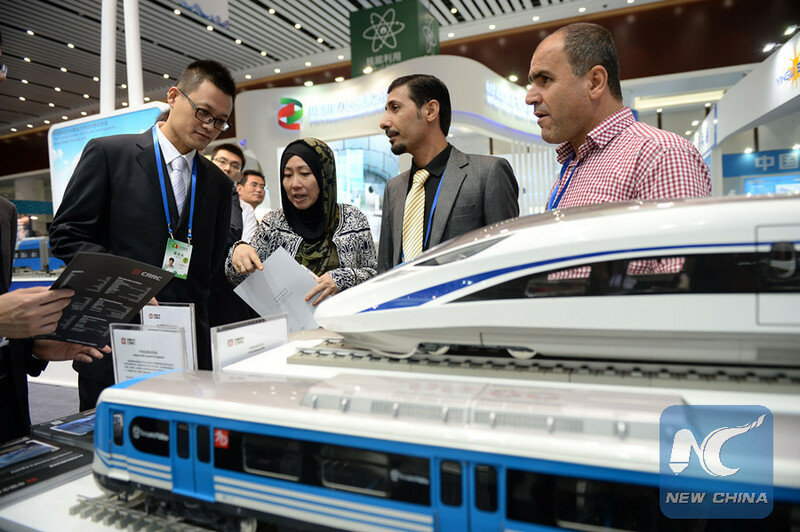 Chinese high-speed rail products on display at the China-Arab States Expo 2015 in Yinchuan, the capital of the Ningxia Hui Autonomous Region. Source: Xinhua/Wang Peng. Finally, as China’s economic and military engagement grows with countries throughout the region, it could soon gain the standing and desire to try its hand diplomatically. A new arbiter is likely to be welcomed in some of the region’s conflicts. So far, the only test was its role in the P5+1 negotiations that led to the Iran nuclear deal, for which it was widely praised but hardly the driving force. China’s good relations with both Israeli and Palestinian leaders may eventually leave Beijing in a position to play a negotiating role in one of the region’s most intractable conflicts. And China is also well-placed, and apparently interested, in mediating the simmering rivalry between two of its closest allies in the region, Iran and Saudi Arabia. If the experiences of past superpowers are any predictor, China will have a difficult time maintaining a neutral position in the Middle East while stepping up its diplomatic and security engagement there. If the experiences of past superpowers are any predictor, China will have a difficult time maintaining a neutral position in the Middle East while stepping up its diplomatic and security engagement there. But President Xi’s stated intention is to distinguish China from others, so perhaps measuring Chinese actions in the region through the lens of the U.S. experience, or that of Russia during the Cold War, or the U.K. or France during colonial times, is misleading. As of now Chinese involvement is nowhere near such levels or ambitions and it remains to be seen whether it will evolve in that direction. A more realistic predictor of what is to come in the Middle East may be China’s relentless economic and development activities in Africa and Latin America—which have been heavily criticized in each case as exploitative, even a “new form of colonialism,” but continue apace nonetheless.111 The Chinese have dramatically changed landscapes in many African and Latin American countries112 through investment that benefits their own economy, primarily,113 but has also created local jobs and improved infrastructure. They have acknowledged “growing pains” in their relationships with African countries and tried to reassure them that they were not following in the footsteps of “Western colonists.”114 In a region similarly sensitive to the vestiges of colonialism and Western meddling, it will be interesting to see how China’s increasing role is received. “President Xi’s Speech at Arab League Headquarters: Full Text,” Xinhua//China Daily, January 21, 2016, http://www.chinadaily.com.cn/world/2016xivisitmiddleeast/2016-01/22/content_23191229.htm. “Foreign Minister Wang Yi Meets the Press,” Ministry of Foreign Affairs of the People’s Republic of China, March 8, 2015, http://www.fmprc.gov.cn/mfa_eng/wjb_663304/wjbz_663308/2461_663310/t1243662.shtml. “Ahead of king’s visit, China says hopes Saudi, Iran can resolve problems,” Reuters, March 8, 2017, http://www.reuters.com/article/us-china-parliament-mideast-idUSKBN16F0KV. “The World in 2050,” PwC, February 2017, http://www.pwc.com/gx/en/issues/economy/the-world-in-2050.html. “The dragon’s new teeth,” The Economist, April 7, 2012, http://www.economist.com/node/21552193. Michael Forsythe, “Rex Tillerson’s South China Sea Remarks Foreshadow Possible Foreign Policy Crisis,” New York Times, January 12, 2017, https://www.nytimes.com/2017/01/12/world/asia/rex-tillerson-south-china-sea-us.html?_r=0. “China Pivots to the Middle East,” The American Interest, September 1, 2016, http://www.the-american-interest.com/2016/09/01/china-pivots-to-the-middle-east/. Yun Sun, “March West: China’s Response to the U.S. Rebalancing,” The Brookings Institution, January 31, 2013, https://www.brookings.edu/blog/up-front/2013/01/31/march-west-chinas-response-to-the-u-s-rebalancing/. Dennis Ross, “How Obama Created a Mideast Vacuum,” The Washington Institute for Near East Policy, January 10, 2016, http://www.washingtoninstitute.org/policy-analysis/view/how-obama-created-a-mideast-vacuum. Beibei Bao, Charles Eichacker, and Max J. Rosenthal, “Is China Pivoting to the Middle East?” The Atlantic, March 28, 2013, https://www.theatlantic.com/china/archive/2013/03/is-china-pivoting-to-the-middle-east/274444/. Jennifer Lind, “Asia’s Other Revisionist Power,” Foreign Affairs, March/April 2017, https://www.foreignaffairs.com/articles/asia/2017-02-13/asias-other-revisionist-power. “Full text of China’s Arab Policy Paper,” Xinhua/China.org.cn, January 14, 2016, http://www.china.org.cn/world/2016-01/14/content_37573547.htm. Andrew Jacobs and Jane Perlez, “U.S. Wary of Its New Neighbor in Djibouti: A Chinese Naval Base,” New York Times, February 25, 2017, https://www.nytimes.com/2017/02/25/world/africa/us-djibouti-chinese-naval-base.html?_r=0. William T. Wilson, “China’s Huge ‘One Belt, One Road’ Initiative is Sweeping Central Asia,” The National Interest, July 27, 2016, http://nationalinterest.org/feature/chinas-huge-one-belt-one-road-initiative-sweeping-central-17150. “Spotlight: China’s Belt and Road Initiative promotes connectivity, development along ancient route,” Xinhua/Xinhuanet, January 2, 2017, http://news.xinhuanet.com/english/2017-01/02/c_135949404.htm. Ankit Panda, “Chinese State Firm Takes Control of Strategically Vital Gwadar Port,” The Diplomat, November 13, 2015, http://thediplomat.com/2015/11/chinese-state-firm-takes-control-of-strategically-vital-gwadar-port/. Jack Farchy, James Kynge, Chris Campbell and David Blood, “One belt, one road: A ribbon of road, rail and energy projects to help increase trade,” Financial Times, September 14, 2016, https://ig.ft.com/sites/special-reports/one-belt-one-road/. Shannon Tiezzi, “The Belt and Road and Suez Canal: China-Egypt Relations Under Xi Jinping,” China Policy Institute, School of Politics and International Relations, University of Nottingham, February 16, 2016, https://cpianalysis.org/2016/02/16/87681/. Mordechai Chaziza, “The Red-Med Railway: New Opportunities for China, Israel, and the Middle East,” The Begin-Sadat Center for Strategic Studies, December 11, 2016, https://besacenter.org/perspectives-papers/385-chaziza-the-red-med-railway-new-opportunities-for-china-israel-and-the-middle-east/. Wu Xia and Ye Shan, “Spotlight: China’s ‘Belt and Road’ initiative boosts Mideast development,” Xinhua/New China, January 19, 2016, http://news.xinhuanet.com/english/2016-01/19/c_135024655.htm. “China, Saudi Arabia agree to boost all-round strategic partnership,” Xinhua/Xinhuanet, March 16, 2017, http://news.xinhuanet.com/english/2017-03/16/c_136134528.htm. “China, Saudi Arabia sign $65 billion in cooperation deals,” Associated Press, March 17, 2017, http://bigstory.ap.org/article/fcc46868a3554a3ead212682f755f409/china-saudi-arabia-sign-65-billion-cooperation-deals. “Middle East & North Africa Imports by Country 2015,” World Integrated Trade Solution, http://wits.worldbank.org/CountryProfile/en/Country/MEA/Year/2015/TradeFlow/Import/Partner/by-country. Massoud Hayoun, “China’s Approach to the Middle East Looks Familiar,” The Diplomat, November 29, 2016, http://thediplomat.com/2016/11/chinas-approach-to-the-middle-east-looks-familiar/. Chen Aizhu and Meng Meng, “Russia beats Saudi Arabia as China’s top crude oil supplier in 2016,” Reuters, January 23, 2017, http://www.reuters.com/article/us-china-economy-trade-crude-idUSKBN1570VJ. “China, Saudis to Discuss CIC, CNPC Investment in Aramco IPO,” Bloomberg, March 16, 2017, https://www.bloomberg.com/news/articles/2017-03-16/china-saudis-said-to-discuss-cic-cnpc-investment-in-aramco-ipo-j0bynknm. Noah Smith, “Trump Has a Point About American Decline,” BloombergView, March 3, 2016, https://www.bloomberg.com/view/articles/2016-03-03/donald-trump-has-a-point-about-american-decline. Ryan Teague Beckwith, “Read a Transcript of the First Presidential Debate Between Hillary Clinton and Donald Trump,” Time, September 26, 2016, http://time.com/4508768/presidential-debate-trump-clinton-transcript/. Vision 2030, Kingdom of Saudi Arabia, http://vision2030.gov.sa/en. Wael Mahdi, Glen Carey, and Rakteem Katakey, “Aramco IPO Seen by Prince as Tonic for Saudis ‘Addicted’ to Oil,” Bloomberg, April 25, 2016, https://www.bloomberg.com/news/articles/2016-04-25/saudi-prince-says-aramco-valuation-seen-at-above-2-trillion. “Aramco tax cut lifts company’s value by $1 trillion, analyst estimates,” Reuters, March 28, 2017, http://www.reuters.com/article/us-saudi-aramco-ipo-valuation-idUSKBN16Z1SH. “Saudi Arabia buys high-tech China drones,” Arab News, September 1, 2016, http://www.arabnews.com/node/978446/saudi-arabia. “Saudi Arabia unveiled CH-4 armed unmanned aerial vehicle,” Defence Blog, January 27, 2017, http://defence-blog.com/news/saudi-arabia-unveiled-ch-4-armed-unmanned-aerial-vehicle.html. Peter Wezeman, email to the author, March 14, 2017. “China’s domestic Wing-Loong II UAS conducts maiden flight,” Xinhua/China Daily, February 28, 2017, http://usa.chinadaily.com.cn/china/2017-02/28/content_28377697.htm. “Saudi Arabia orders 300 Chinese strike-capable reconnaissance unmanned aerial vehicles,” Defence Blog, March 20, 2017, http://defence-blog.com/news/saudi-arabia-orders-300-chinese-strike-capable-reconnaissance-unmanned-aerial-vehicles.html. Peter Bergen, David Sterman, Alyssa Sims, Albert Ford, and Christopher Mellon, “World of Drones,” New America Foundation, https://www.newamerica.org/in-depth/world-of-drones/. Jeremy Binnie, “Saudi Arabia to build Chinese UAVs,” IHS Jane’s Defence Weekly, March 23, 2017, http://www.janes.com/article/68975/saudi-arabia-to-build-chinese-uavs. Minnie Chan, “Chinese drone factory in Saudi Arabia first in Middle East,” South China Morning Post, March 26, 2017, http://www.scmp.com/news/china/diplomacy-defence/article/2081869/chinese-drone-factory-saudi-arabia-first-middle-east. “China and Saudi Arabia hold joint anti-terrorism drills,” The New Arab, October 27, 2016, https://www.alaraby.co.uk/english/news/2016/10/27/china-and-saudi-arabia-hold-joint-anti-terrorism-drills. Thomas Erdbrink, “China Deepens Its Footprint in Iran After Lifting of Sanctions,” New York Times, January 24, 2016, https://www.nytimes.com/2016/01/25/world/middleeast/china-deepens-its-footprint-in-iran-after-lifting-of-sanctions.html. Golnar Motevalli, “China, Iran Agree to Expand Trade to $600 Billion in a Decade,” Bloomberg, January 23, 2016, https://www.bloomberg.com/news/articles/2016-01-23/china-iran-agree-to-expand-trade-to-600-billion-in-a-decade. Harold Pachios, “Let’s look at China’s role in the Iran nuclear deal,” The Hill, August 21, 2015, http://thehill.com/blogs/congress-blog/foreign-policy/251657-lets-look-at-chinas-role-in-the-iran-nuclear-deal. “Joint Comprehensive Plan of Action,” U.S. Department of State, July 14, 2015, https://www.state.gov/documents/organization/245317.pdf. “China warns against obstruction of Iran nuclear deal,” The New Arab, December 5, 2016, https://www.alaraby.co.uk/english/news/2016/12/5/china-warns-against-obstruction-of-iran-nuclear-deal. Huileng Tan, “China tilts to Iran as Xi caps visit with 17 accords,” CNBC, January 25, 2016, http://www.cnbc.com/2016/01/25/china-tilts-to-iran-as-xi-caps-visit-with-17-accords.html. Zhuang Pinghui, “Key facts behind China’s warming ties with Saudi Arabia, Iran and Egypt as Xi Jinping signs mega oil deals during his Middle East tour,” South China Morning Post, January 20, 2016, http://www.scmp.com/news/china/diplomacy-defence/article/1903393/key-facts-behind-chinas-warming-ties-saudi-arabia-iran. Ahmed Feteha, “Egypt, China Sign $2.6B Currency Swap Boosting Pound Flotation,” Bloomberg, December 6, 2016, https://www.bloomberg.com/news/articles/2016-12-06/egypt-china-seal-2-4-billion-currency-swap-transaction. Kieron Monks, “Egypt is getting a new capital – courtesy of China,” CNN Style, October 10, 2016, http://www.cnn.com/2016/10/09/africa/egypt-new-capital/. Eric Knecht, “Egypt’s capital project hits latest snag as Chinese pull out,” Reuters, February 8, 2017, http://www.reuters.com/article/egypt-china-construction-idUSL5N1FT5IY. “China’s Initiation of the Five Principles of Peaceful Co-Existence,” Ministry of Foreign Affairs of the People’s Republic of China, http://www.fmprc.gov.cn/mfa_eng/ziliao_665539/3602_665543/3604_665547/t18053.shtml. Adam Taylor, “Bashar al-Assad says relations between Syria and China are ‘on the rise,’ Washington Post, March 12, 2017, https://www.washingtonpost.com/news/worldviews/wp/2017/03/12/bashar-al-assad-says-relations-between-syria-and-china-are-on-the-rise/?utm_term=.3e3f1e638aa4. “Trade Registers,” Stockholm International Peace Research Institute, http://armstrade.sipri.org/armstrade/page/trade_register.php. Government of the People’s Republic of China, “China to donate humanitarian aid to Syria worth $16m,” ReliefWeb, February 6, 2017, http://reliefweb.int/report/syrian-arab-republic/china-donate-humanitarian-aid-syria-worth-16m. “Statement by Ambassador Liu Jieyi at the Security Council Debate on Syria,” Permanent Mission of the People’s Republic of China to the UN, May 4, 2016, http://www.china-un.org/eng/gdxw/t1362530.htm. “Note to Correspondents: Statement of the International Syria Support Group,” United Nations Secretary-General, May 17, 2016, https://www.un.org/sg/en/content/sg/note-correspondents/2016-05-17/note-correspondents-statement-international-syria-support. “China appoints first special envoy for Syria crisis,” Reuters, March 29, 2016, http://www.reuters.com/article/us-mideast-crisis-syria-china-idUSKCN0WV0RG. “Security Council – Veto List,” Security Council – Quick Links, Dag Hammarskjöld Library, United Nations, http://research.un.org/en/docs/sc/quick. “Security Council Fails to Adopt Two Draft Resolutions on Syria, Despite Appeals for Action Preventing Impending Humanitarian Catastrophe in Aleppo,” United Nations Security Council, October 8, 2016, https://www.un.org/press/en/2016/sc12545.doc.htm. “China Ready to Work With Russia on Post-War Reconstruction in Syria,” SANA, April 29, 2016, http://sana.sy/en/?p=75985. Peter Wood, “Chinese Military Promises Aid to Syria,” The Jamestown Foundation, August 22, 2016, https://jamestown.org/program/chinese-military-promises-aid-to-syria/. Wendy Wu and Zhen Liu, “China’s help in EU refugee crisis would be welcome, says German ambassador to China,” South China Morning Post, October 28, 2015, http://www.scmp.com/news/china/diplomacy-defence/article/1873546/chinas-help-eu-refugee-crisis-would-be-welcome-says. Liang Pan, “Why China Isn’t Hosting Syrian Refugees,” Foreign Policy, February 26, 2016, http://foreignpolicy.com/2016/02/26/china-host-syrian-islam-refugee-crisis-migrant/. Junyi Zhang, “Chinese foreign assistance, explained,” Brookings Institution, July 19, 2016, https://www.brookings.edu/blog/order-from-chaos/2016/07/19/chinese-foreign-assistance-explained/. Fuad Rajeh, “China urges constructive move to serve peace in Yemen,” Xinhua/New China, December 5, 2016, http://news.xinhuanet.com/english/2016-12/05/c_135880006.htm. “Yemen crisis: China evacuates citizens and foreigners from Aden,” BBC, April 3, 2015, http://www.bbc.com/news/world-middle-east-32173811. Yun Sun, “Syria: What China Has Learned From its Libya Experience,” Asia Pacific Bulletin, Number 152, East-West Center, February 27, 2012, http://www.eastwestcenter.org/sites/default/files/private/apb152_1.pdf. Joseph Braude and Tyler Jiang, “Djibouti is Jumping,” E-Notes, Foreign Policy Research Institute, March 31, 2016, http://www.fpri.org/article/2016/03/djibouti-is-jumping/. Keith B. Richburg, “China, after abstaining in U.N. vote, criticizes airstrikes on Gadaffi forces,” Washington Post, March 21, 2011, https://www.washingtonpost.com/world/china-after-abstaining-in-un-vote-criticizes-airstrikes-on-gaddafi-forces/2011/03/21/ABwL4M7_story.html?utm_term=.3f85667d26cc. Graeme Smith, “China offered Gadhafi huge stockpiles of arms: Libyan memos,” The Globe and Mail, September 2, 2011, http://www.theglobeandmail.com/news/world/china-offered-gadhafi-huge-stockpiles-of-arms-libyan-memos/article1363316/. Jonas Parello-Plesner and Mathieu Duchatel, China’s Strong Arm: Protecting Citizens and Assets Abroad (London: International Institute for Strategic Studies, 2015), accessed March 22, 2017, https://www.iiss.org/en/publications/adelphi/by%20year/2015-9b13/chinas-strong-arm-63b7/ap451-07-chapter-5-7ffb. Sheryl WuDunn, “Israel-China Relations Nearly Official,” New York Times, January 22, 1992, http://www.nytimes.com/1992/01/23/world/israel-china-relations-nearly-official.html. Ben Caspit, “Why Netanyahu’s ‘Asian Option’ is raising eyebrows in Israel,” Al-Monitor, August 15, 2016, http://www.al-monitor.com/pulse/originals/2016/08/israel-china-rapprochement-putin-netanyahu-russia-bds.html. “China’s Xi tells Israel that peaceful Middle East good for all,” Reuters, March 21, 2017, http://www.reuters.com/article/us-china-israel-idUSKBN16S1OE. Michal Shmulovich and AP, “China unveils peace plan based on 1967 lines,” Times of Israel, May 7, 2013, http://www.timesofisrael.com/china-unveils-peace-plan-based-on-1967-lines/. “China Raises Five-Point Peace Proposal on Settling Israel-Palestine Conflict,” Ministry of Foreign Affairs of the People’s Republic of China, August 4, 2014, http://www.fmprc.gov.cn/mfa_eng/zxxx_662805/t1180306.shtml. Edward Wong, “China Invests in Region Rich in Oil, Coal and Also Strife,” New York Times, December 20, 2014, https://www.nytimes.com/2014/12/21/world/asia/china-invests-in-xinjiang-region-rich-in-oil-coal-and-also-strife.html?_r=0. “About Uyghurs,” The Uyghur American Association, http://uyghuramerican.org/about-uyghurs. James Palmer, “The Uighurs, China’s Embattled Muslim Minority, Are Still Seeking an Identity,” The Atlantic, September 27, 2013, https://www.theatlantic.com/china/archive/2013/09/the-uighurs-chinas-embattled-muslim-minority-are-still-seeking-an-identity/280065/. “Xinjiang to crack down on ‘three evil forces,’” Xinhua/China Daily, March 6, 2012, http://www.chinadaily.com.cn/china/2012-03/06/content_14766900.htm. Associated Press, “Muslim countries mostly silent on China unrest,” NBC News, July 13, 2009, http://www.nbcnews.com/id/31893032/ns/world_news-asia_pacific/t/muslim-countries-mostly-silent-china-unrest/#.WMcUQvkrJPZ. Agence France-Presse, “Turkish PM Erdogan likens Xinjiang violence to ‘genocide,’” July 10, 2009, http://www.france24.com/en/20090710-turkish-pm-erdogan-xinjiang-violence-genocide-turkey-uighurs-han-trade-beijing-china/. “Clerics stand up for rights of Uyghur Muslims,” Tehran Times, July 14, 2009, http://www.tehrantimes.com/news/198757/Clerics-stand-up-for-rights-of-Uyghur-Muslims. “Xinjiang: PRC Scrambles to Avoid Anti-Islam Image Abroad and Kill OIC Declaration,” WikiLeaks, July 17, 2009, https://wikileaks.org/plusd/cables/09BEIJING2041_a.html. Nate Rosenblatt, “All Jihad is Local,” New America Foundation, July 2016, 28, https://na-production.s3.amazonaws.com/documents/ISIS-Files.pdf. Shamil Shams, “Why China’s Uighurs are joining jihadists in Afghanistan,” Deutsche Welle, July 24, 2015, http://www.dw.com/en/why-chinas-uighurs-are-joining-jihadists-in-afghanistan/a-18605630. Jack Moore, “ISIS Fighters From China’s Uighur Minority Vow to ‘Shed Blood’ at Home,” Newsweek, March 2, 2017, http://www.newsweek.com/isis-fighters-chinas-uighur-minority-vow-shed-blood-home-562948. International Institute for Strategic Studies, The Military Balance 2017 (London: Routledge, 2017), 19. Ethan Meick, “China-Russia Military-to-Military Relations: Moving Toward a Higher Level of Cooperation,” March 20, 2017, U.S.-China Economic and Security Review Commission, https://www.uscc.gov/sites/default/files/Research/China-Russia%20Mil-Mil%20Relations%20Moving%20Toward%20Higher%20Level%20of%20Cooperation.pdf. David Shinn, “Africa: China’s Laboratory for Third World Security Cooperation,” China Brief, The Jamestown Foundation, July 6, 2016, https://jamestown.org/program/africa-chinas-laboratory-for-third-world-security-cooperation/. Katrina Manson, “China military to set up first overseas base in Horn of Africa,” Financial Times, March 31, 2016, https://www.ft.com/content/59ad20d6-f74b-11e5-803c-d27c7117d132. Jeremy Page, “China Builds First Overseas Military Outpost,” Wall Street Journal, August 19, 2016, https://www.wsj.com/articles/china-builds-first-overseas-military-outpost-1471622690?mg=id-wsj&mg=id-wsj. Jérôme Henry, “China’s Military Deployments in the Gulf of Aden: Anti-Piracy and Beyond,” Institut français des relations internationales (Ifri) Center for Asian Studies, November 2016, https://www.ifri.org/sites/default/files/atoms/files/chinas_military_deployments_in_the_gulf_of_aden_anti-piracy_and_beyond_0.pdf. “Chinese president pledges support for UN peacekeeping,” Xinhua/China Military Online, September 29, 2015, http://english.chinamil.com.cn/news-channels/china-military-news/2015-09/29/content_6703853.htm. LTC (Ret.) James Dickey, phone interview with the author, March 27, 2017. Aude Fleurant, Sam Perlo-Freeman, Pieter D. Wezeman and Siemon T. Wezeman, “Trends in International Arms Transfers, 2015,” Stockholm International Peace Research Institute, February 2016, http://books.sipri.org/files/FS/SIPRIFS1602.pdf. “China Is a Growing Threat to Global Competitors, Kroeber says,” Bloomberg News, June 28, 2016, https://www.bloomberg.com/news/articles/2016-06-28/kroeber-sees-china-mercantilism-as-a-growing-global-threat-q-a. Theodore Karasik, “The GCC’s New Affair with China,” Middle East Institute, February 24, 2016, http://www.mei.edu/content/map/gcc%E2%80%99s-new-affair-china. Kyle Mizokami, “For the First Time, Chinese UAVs Are Flying and Fighting in the Middle East,” Popular Mechanics, December 22, 2015, http://www.popularmechanics.com/military/weapons/news/a18677/chinese-drones-are-flying-and-fighting-in-the-middle-east/. “China and Saudi Arabia hold joint anti-terrorism drills,” The New Arab. Charles Clover, “Mystery deepens over Chinese forces in Afghanistan,” Financial Times, February 26, 2017, https://www.ft.com/content/0c8a5a2a-f9b7-11e6-9516-2d969e0d3b65. Lamido Sanusi, “Africa must get real about Chinese ties,” Financial Times, March 11, 2013, https://www.ft.com/content/562692b0-898c-11e2-ad3f-00144feabdc0. Clifford Krauss and Keith Bradsher, “China’s Global Ambitions, Cash and Strings Attached,” New York Times, July 24, 2015, https://www.nytimes.com/2015/07/26/business/international/chinas-global-ambitions-with-loans-and-strings-attached.html?_r=0. Lily Kuo, “China now owns more than half of Kenya’s debt,” Quartz, June 15, 2016, https://qz.com/707954/china-now-owns-more-than-half-of-all-of-kenyas-debt-2/. “One among many,” Economist, January 15, 2015, http://www.economist.com/news/middle-east-and-africa/21639554-china-has-become-big-africa-now-backlash-one-among-many.